Increase your trading returns with Alvexo's Forex signals: learn how to incorporate indicators and signals in your trading strategy. Forex trading signals are a valuable tool in your resource kit. Thanks to signals, you can make decisions about whether you should buy/sell a currency pair at any point in time. Signals can be generated by way of fundamental analysis or technical analysis. Many factors work in sync with one another to generate buy/sell signals for you to act upon. Various Forex brokerages offer signals to their traders for a nominal fee or for free. Entry and exit points can be determined when using Forex trading signals, and when done right you can successfully trade utilizing these signals. Signals are part of broader computer software programs that can be programmed to buy/sell currency pairs when certain parameters are met. Complex algorithms and high-tech computer software go into creating automated Forex trading systems. By using these types of programs, you can remove the emotional component of trading Forex. It should be remembered that no software program can generate successful returns at all times; signals are not designed to be perfect – they are indicators of opportunity in the Forex markets. What are the Benefits of using Indicators? Trading indicators are devoid of emotion since they are automated programs. This is precisely what you need to succeed as a Forex trader. Emotional trading clouds your judgement and automated trading offers a fresh, objective perspective for your Forex trading sessions. There are human components required with all trading signals, and the best approach to adopt is one that takes that into consideration. As a result, the Parabolic SAR stops and reverses according to what the price trend is doing. It will then move above/below the indicator. Calculation of the actual stop and reverse indicator is complicated, and for the purposes of simplicity, two components are looked at. These include the rising SAR and the falling SAR. This indicator is ideally suited to trending securities. It follows these trends in much the same way as a trailing stop, and the quality of the signal is wholly dependent on the settings of the underlying security. Provided the right settings have been inputted, strong market trends can be identified and a Parabolic SAR indicator can be an effective trading system. When the wrong settings have been input, there are multiple whipsaws and associated losses. Parabolic SAR indicators are ideally suited to Forex trading with technical analysis. When it comes to different types of moving averages, we can limit our discussion to the following: Simple Moving Averages, Weighted Moving Averages and Exponential Moving Averages. A Simple Moving Average is easily calculated by taking price points/reporting periods adding them up, and dividing them by the data points. The result of this calculation is an average of prices. For Forex trading purposes, you could include the last 20 prices (exchange rates) in your moving average calculation. The average will continually move when a new price is added. A Weighted Moving Average works in much the same way as a Simple Moving Average with the exception that linear weighted averages are used. Higher weights are assigned to foreign exchange rates that are more recent. As a Forex trader, you will find this method to be beneficial when the markets are moving quickly. The only downside to using a Weighted Moving Average is that it may be difficult to determine fluctuations from market trends. An Exponential Moving Average calculates an average of all the historical ranges in the series. It is similar in many respects to the Simple Moving Average vis-a-vis the number of reporting periods, but it differs in the way that the calculation is made with prices. In an Exponential Moving Average there are additional reporting periods included. All Moving Averages are lagging indicators. They represent events that have already taken place and they are not predictive indicators. What they are good at is determining how strong a current market trend is as well as differentiating between typical exchange-rate fluctuations and true market reversal points. The MACD trading strategy is used as an indicator for when to buy and sell currency pairs. This trend-following indicator features a 26-day EMA (Exponential Moving Average), a 12-day EMA (Exponential Moving Average) and a 9-day EMA (Exponential Moving Average) – otherwise known as the signal line. 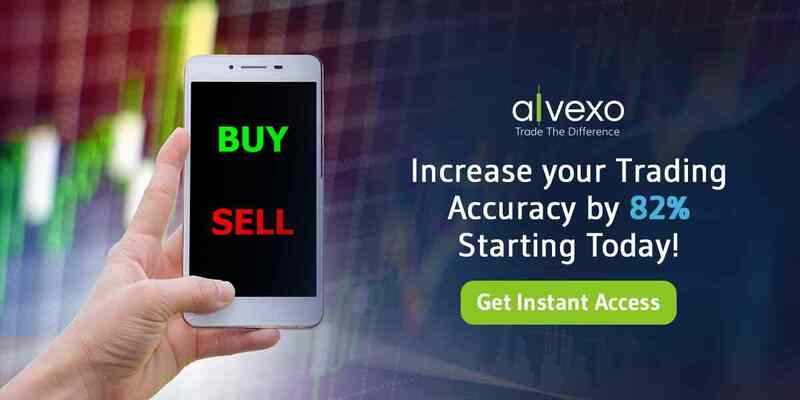 You can receive trading signals from Alvexo when you open an Alvexo trading account.